Martial Arts are one of the very best possible activities you could ever enroll your children in. At Mushin Self Defense, we teach kids self respect and self confidence. This leads to respect for others and responsibility for their actions. Our students learn how to be hard targets and guardians of their peers and siblings. They learn kindness, humility and compassion while at the same time learning how to physically defend themselves at all ranges of physical combat (Punching, Kicking, Takedowns, and Grappling). We are not a Mc Dojo who sells belts. Students EARN their ranks and it shows in the feeling of accomplishment when they reach their goals through hard work and discipline. One look at these kid’s faces and you can see the pride they have in their accomplishments. What video game or physical activity can create this same feeling? There are definitely excellent skills and lessons that can be learned in traditional sports but the relationship between a teacher and a student in the Martial Arts is often life long as opposed to only a few months out of a year. This gives Martial Artists the unique opportunity to be a positive influence throughout a young person’s formative years. This influence is based on the trust and mutual respect that can only be developed over time. We combine the traditional values of Discipline and Respect, with modern training and teaching methods to give our students the very best experience possible. If you are interested in providing your son or daughter with the many benefits of the Martial Arts then Mushin Self Defense is the place for you. 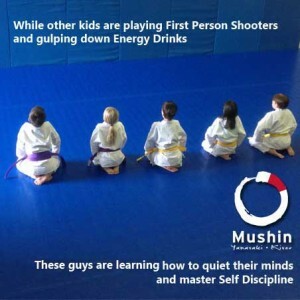 If you are looking for a fun, clean, family friendly, and safe training environment, Mushin Self Defense is exactly what you are looking for. If you live in Utah, in the Davis County Area, in North Salt Lake, Salt Lake, Bountiful, Woodscross, Centerville, or Farmington and are interested in providing your child Self Defense, Mushin Self Defense is the only Kids Karate Program that has certified instructors who will teach them, authentic proven Mixed Martial Arts, Brazilian Jiu-jitsu, Catch Wrestling, Thai Boxing techniques. Call us at 801-635-4877 for more information or stop by our gym at 230 North Cutler Drive in North Salt Lake Utah.